Worm castings have always been a viable alternative to chemical fertilizer. But, with the rising cost of oil, their place in agriculture and horticulture is become becoming more important than ever. 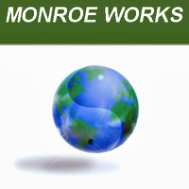 A new process, developed by Larry Martin* of Vermitechnology Unlimited, works with Mother Nature, actually assisting her to create an earth friendly, organic fertilizer from worm castings. Through this process, you get a more powerful and beneficial fertilizer - Black Castings™. Vermitechnology discovered a way to "super-charge" the castings created naturally by earth worms, producing a more potent plant fertilizer. This patented process boosts to maximum potency the broad spectrum plant nutrients found naturally in "worm poop", creating Black Castings™. 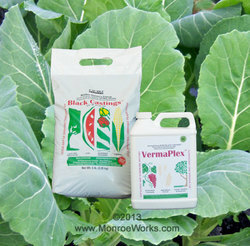 These same pure worm castings are used in the production of VermaPlex®, the legendary liquid soil amendment. 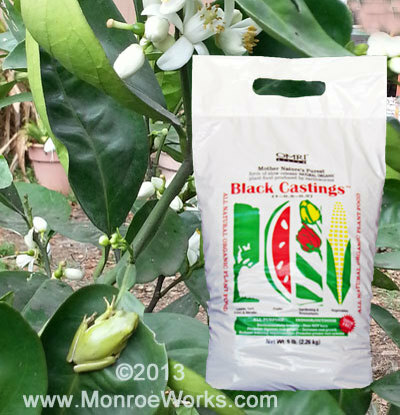 Black Castings™ provide the essential nutrients plants need to thrive and grow in a form that is readily available. They are not derived from petroleum products, but from the "poop" left behind after earthworms process organic matter. These organic worm castings are teeming with micro-nutrients and living soil microorganisms so essential to soil improvement and plant development. And Black Castings™ are certified organic, OMRI listed. When you use Pure Black Casting™ , you improve your soil through enhanced microbial biodiversity. With the first application, you return life back to the soil. An additional benefit is that, as your soil improves and your plants thrive, your fertilizing costs decrease. 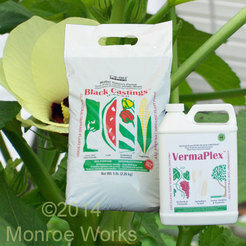 Use VermaPlex® along with Pure Black Castings™ for better results. Why makes Black Castings™ special? Give your soil the fertilizer it needs to grow delicious vegetables, healthy plants, lush lawns, and productive crops. Mother Nature will thank you. Order a Combo worm castings/liquid fertilizer today and save on shipping.